The first post in this series on the New York Court Watcher introduced the subject of the court inherited by Jonathan Lippman as the successor to now-retired Chief Judge Judith Kaye. 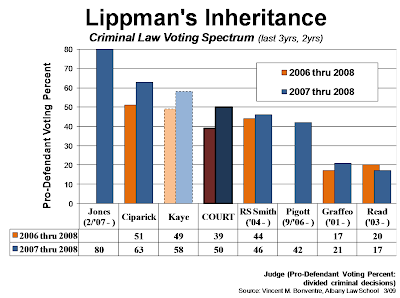 Who are the Judges who make up the court over which Lippman now presides? More specifically, how have these new colleagues of his been voting on the state's highest court before he arrived on the scene? What are their track records? Our examination has begun with criminal cases. 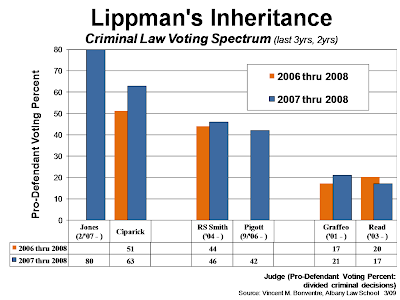 (See Court of Appeals: What Lippman Inherited (Part 1-Criminal Law Voting), March 8, 2009.) Let's take another look, with a couple of new graphs to help. This graph is a reorganization of the one included in the March 8 post. The Judges are reordered to illustrate more clearly the Court's spectrum of pro-defendant voting--i.e., voting for the position more favorable to the criminal suspect or accused--from the most, Judge Theodore Jones, to the least, Judges Victoria Graffeo and Susan Read. As depicted in GRAPH 1, the three Judges appointed by Democratic Governors have voting records more pro-defendant (read "liberal") than the Court as a whole. That's Mario Cuomo appointees Judith Kaye and Carmen Ciparick, and Eliot Spitzer appointee Theodore Jones. Not unexpected. Likewise, the four Judges appointed by Republican Governor Pataki have voting records that are more pro-prosecution--i.e., less pro-defendant--(read "conservative). That's Susan Read, Victoria Graffeo, Eugene Pigott and Robert Smith. Again, not unexpected. But when the very same data is depicted a bit differently on the same basic graph, some less expected patterns are highlighted. With retired-Kaye and the Court as a whole removed from the graph, and with space injected to separate some of the Judges, what emerges is 3 pretty distinct pairings among the current Court's membership. But then there are the other two Republican (Pataki) appointees: Judges Smith and Pigott. Their voting records are twice as pro-defendant as Graffeo's and Read's. Yes, twice as liberal. Indeed, both Smith and Pigott have voting records as close to Ciparick's as to their fellow Pataki appointees. Their voting places them at the Court's center. Not only as the pair midway between the more liberal Jones/Ciparick and more conservative Graffeo/Read, but also (as depicted in GRAPH 1) with voting records which are ideologically very close to the decisional record of the Court as a whole. So where will Lippman fit in? With Jones/Ciparick, Graffeo/Read, or Smith/Pigott? Or will his voting place him in between one of those pairs, or even outside one of the Court's current ideolgical ends? Maybe his presence will change the Court's dynamics and actually alter it's ideological spectrum. Time will tell. But as for now, the Judges' voting spectrum in criminal cases is quite clear, and three ideological pairings are remarkably well-defined. In the next post in this series we'll take a look at the voting alignments in criminal cases. Not just the ideological similarities, but who's voting with whom, as well as who's voting in the majority.